The Navigation Log / Flight Plan Form is the perfect planning partner for a smooth flight. Jeppesen's well-organized flight planning log. Unlike APR's competitors' student computers which are made with paper, composite, or fiber board, APRﾒs student computers are made with PVC Plastic. IFR Radio Facility Chart Plotter has 12 scales for Jeppesen Radio Facility & NACO Charts and opposing compass rose plotters. Simplify your flight planning with this handy, easy to use plotter. This new aluminum flight computer has color markings to make reading easier! Standard E6B flight computer for easy use. Heavy duty metal construction assures long life, high accuracy and enduring quality. 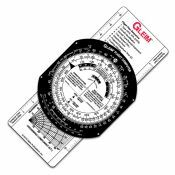 The PN-1 Navigation Plotter features an opaque background and laminated design which means you'll be able to identify the scales quickly and effortlessly - for years to come. Twelve scales to accommodate both NACO and Jeppesen charts as well as holding pattern guide.